Today is April 2nd. It's the international "Autism Awareness Day". People are encouraged to wear blue to show their support of this "awareness" and many bloggers will post every single day throughout the month to raise "awareness". I'm not one of those bloggers. My posts will come out as and when I have relevant and useful material to contribute. It's rare that I interrupt a series of posts for a specific event but I thought I should talk about the whole Autism Awareness thing. 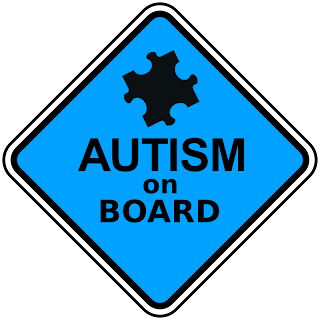 I'm all for the world understanding and accepting and loving people with autism - in fact, I'd extend the whole courtesy to people without autism too. To cats, dogs, mice, lizards and plants. I suppose that it's a nice gesture but to me, the whole blue thing is as irritating as those "baby on board" signs. You know the signs on cars that make you wonder what you're supposed to do? Cooo as you go past? Offer milk? The problem with the whole "Autism Awareness" thing (and it's called other names too; Autism Appreciation, Autism Acceptance, Autism Bubble Day etc), is that it's all about the condition - not the people. No, I'm not suggesting that we call it; "Person with Autism Awareness Day" because that would be both pedantic and superflous. Instead, I'm suggesting that we make it more useful. Why not make it "Do a deed for a person with Autism" month. Just one deed, that would nice. Encouraging or motivating a person with autism. Instead of spending the day telling the world that if a person has autism, others have to "grit their teeth and just accept it", why not spend the day helping a person with autism forget that they live in a world in which they are considered an underdog. Yes! This! it feels like this bizarre parade of slogans happening around me for 24 hours that have nothing to do with my reality. The baby on board signs are there to make you think twice about tailgating or driving like a jerk around that car. Or so I assume since it's shaped like a traffic warning sign.